I have recently been replacing my kitchen gadgets after my toaster caught fire. I decided to go for a chrome look. Having replaced my bread bin, toaster, kettle, dish drainer all in chrome all that was left was to replace the cream dustbin that looked really out of place in my kitchen. I looked around many sites as I wanted a bin that was large enough to take trash for a family of four but also looked smart and elegant. Almost as if my prayers were answered I was offered the opportunity to take part in RakutenPlay.com -#ReasonsToShop campaign. The site is a haven for everything from books, toys, home and garden, electronics, cloths and much more.RakutenPlay.com run a loyalty scheme by awarding super points to people who shop on their site too. I eagerly browsed through the site and after making a wish list of 10 items, I put my sensible hat on and selected the perfect bin to match the rest of my kitchen accessories. 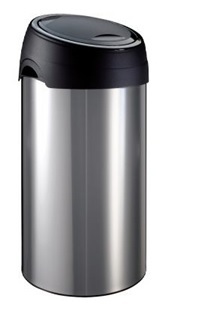 I chose the Meliconi Steel 60L Kitchen Waste Bin in Silver. It is a good family size bin and looks really stylish in my kitchen. They have been also been very generous and they have kindly offered £30.00 credit to one simply.food reader to spend on their site. I would like to Thank RakutenPlay.com for giving me the opportunity to participate in their #ReasonsToShop campaign .All the views and opinions in this post are my own. This competition is open to UK residents only who are over 18 years old .Please read the rules below . I'd go for a new kettle. Ours works (just) but it's scratched, dinged and grubby so it would be lovely to have one that brightened up the kitchen. I'm sure there are a few trashy Pop albums on the site that my mum would like! I'd buy an ice cream maker for the summer! I would get some new headphones, as mine broke recently. A couple of Red Dwarf Boxsets. I'd get a decent Lemon zester like the Oxo good grips one on their website. I'd buy outdoor toys for the kids! I'd put it towards some new kitchen gadgets, starting with a set of digital scales. My old ones are on their way out! A new keyboard and mouse for my computer. Definitely something for father's day - maybe the ice cream maker? I'd put it towards some new baking trays/tins as you can never have too many! I'd put it towards some trainers as mine are leaking and so far I haven't found a pair I like. A gadget for my husband as it is his Birthday soon! I'd spent it on books! some new DVD's for my son. I'd buy some CD's for my husband for Fathers Day. A selection of my favourite spaghetti westerns. I'd love to buy some clothes from the Boohoo section :) I need some summery things! I'd treat myself to some books. id get some game of thrones gifts for my partner. im liking the look of the ceramic 'winter is coming' stein! Breaking bad box set, really want to see it! I'd get some crafty bits.. cushion pads or cross stitch kits. Or maybe some lights for the garden. Or maybe both! hmmm... 12 years a a slave dvd and a new release cd! A DVD boxset to entertain me during the wet summer days. I would head over to the pet section and buy FreyaWoof a new coat I think. The final Dexter boxset, I think. I would choose a new office chair. My son really wants Pokemon X and it's £31.75 on Play.com so I wouldn't have to put much towards it! Wolf of Wall Street DVD, not sure what else yet! A treat for myself!!! How nice would that be???!! !